Orchids are beautiful and unique flowers known for their symbolism of love and beauty. They offer a magical attraction through vibrant colors, beautiful shapes and delicious scents. There are more than 30,000 species of orchids all over the world and people have crossbred these flowers to create more than 150,000 hybrids. Evidence of these breathtaking flowers appeared more than 120 million years ago, making them one of the largest and oldest families of plants in the world. You can find orchids taking on many forms such as a corsage at a prom or wedding, as a centerpiece for a fancy event or sitting on a counter or table gracing a home with its elegance. The high standard associated with orchids may contribute to the belief that they are difficult to grow and care for. Realistically, these are not difficult plants at all. In fact, with a few basic tips and tricks for orchid care and an understanding of how they grow, you can easily make your orchid grow and bloom for a long time. Orchid care is not difficult it’s just different. If you are new to orchids, don’t be afraid, just take the time to learn what they need. The experts at Interior Gardens put together an easy to follow how-to guide for proper orchid maintenance to help you provide for your beautiful orchid arrangements. Orchids can usually adapt to most conditions, but it’s important to choose a plant that is suited to your home. Once you get the hang of orchid care and understand the way the plant works and grows, you can move on to more delicate and fussy species of orchids. When choosing your plant it’s important to think about how much space it will have to grow and what the temperature requirements are for it to thrive. Orchids are not like traditional potted plants, they are epiphytes, which means that they do not grow in soil, but in the air. In tropical environments, the roots of the flower attach to trees or rocks so they can capture moisture and nutrients. This means they require a pot with extremely good ventilation and drainage. The secret to growing healthy orchids it to grow healthy roots. Place your orchids in the smallest pot that will fit the roots and allow the plant to adjust. A clear plastic pot is an excellent choice so that you can pay attention to what is happening in the pot without disturbing the plant. Spring is usually the time around which you should be re-potting your orchid. There are many different varieties of orchids so it is important to be familiar with the specific species of the plant before you water it, because different breeds have different needs. Since orchids are potted in bark mix rather than potting soil, any water poured into the pot immediately ends up at the bottom. You need to allow the bark to absorb the water. Generally you should water your orchid flowers heavily every week during the summer months and cut back to once or twice a month during the winter months. Over winter you can mist the orchid to make sure it stays hydrated. Orchids have different light needs determined by their species. They don’t need bright direct sunshine, but they also don’t like being shunned to a dark corner. Orchids enjoy sunlight with speckled shade and they will also respond to fluorescent light bulbs. Orchids can be grouped into three temperature categories – cool, warm and intermediate. As with light, some orchids can adapt to a variety of temperatures. Orchids also grow better in humid environments that mirror their tropical roots. If you group your plants together you can create higher humidity in their immediate growing area. If you notice yellowing or wrinkled leaves or no blooming flowers you need to alter your caring habits. Once an orchid finds a happy and comfortable spot it will fall into a routine and stay happy. 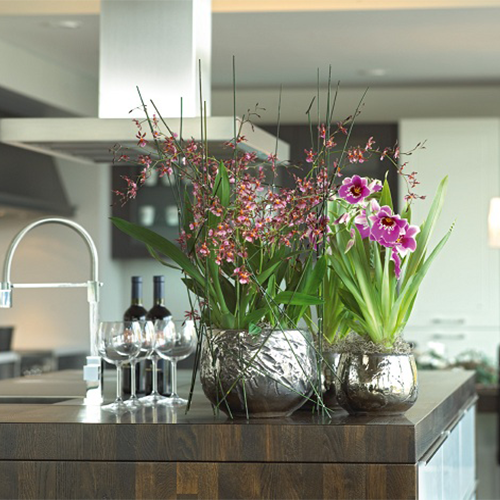 Orchids make wonderful and rewarding indoor flowers that add serenity and beauty to the home. There’s a common misconception associated with these plants that labels them as tough to grow and hard to care for. Regardless of what most people think, orchids are extremely adaptable and once they get comfortable they will easily continue to grow and bloom. In order to take care of an orchid, it’s important for the caregiver to understand how orchids work. Contact us to learn more about the beautiful orchid flowers and how to properly maintain them. If you are interested in bringing orchids into your home, our team will provide a personalized guide to help you care for your orchids so you can fully enjoy them. Through our Orchids Program we offer the finest orchids in Las Vegas for residential and commercial spaces.